This tart was inspired by a recipe from Cooking Light. First I have to say, the topping was phenomenal. The flavors were just fantastic! All of the fresh veggies and herbs were complimented by the flavorful cheeses. It was a like a party where everyone got along, right in your mouth. In the CL recipe a cracker-like crust was the base for the tart. It didn't seem too complicated, actually it was very easy to make, but I thought I would be different and make a fillo crust since I had some in the freezer. BIG MISTAKE. Of course the outer edges look golden and beautiful, but the underneath was soft and soggy. I should have known better. I mean it was edible, but I was disappointed that you couldn't pick up a piece and take a bite like a pizza. :( So If you want to make this recipe, it wouldn't be the worst thing in the world to use a fillo crust, but if you're like me and prefer a crunchy crust, use one of your own tried and true crust recipes. Cut a half circle through 16-20 sheets of fillo, 1" larger than the tart pan. Overlap the 1/2 circle sheets in the center to form a full circle to fit the pan (the fillo circle should be large enough to go completely up the sides of the pan), spraying each layer with cooking spray as you go along. Bake empty tart shell for about 8 to 10 minutes or until golden brown. Set aside to cool. Arrange eggplant on several layers of paper towels. Sprinkle eggplant with 1/2 teaspoon salt; let stand 15 minutes. Pat dry with paper towels; brush eggplant with 1/2 teaspoon oil. Arrange eggplant in a single layer on 2 baking sheets coated with cooking spray. Bake at 375° for 10 minutes. Stack eggplant slices on a plate; cover with plastic wrap. Let eggplant stand to steam while preparing next ingredients. Heat a large nonstick skillet coated with cooking spray over medium-low heat. Add garlic; cook 1 minute, stirring constantly. Remove from heat; stir in 1/4 teaspoon salt, basil, oregano, parsley, and mint. Sprinkle 2 tablespoons scamorza on bottom of baked crust. Layer eggplant and tomatoes in crust, sprinkling evenly with garlic-herb mixture; sprinkle with remaining scamorza and Romano cheese. Bake at 375° for 10 minutes or until cheese melts. Cut into 4 large wedges. It looks great to me! I love eggplant so I know I would like this. Better luck next time with the crust! 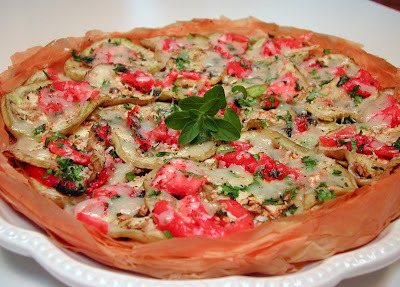 I love eggplant and tomatoes...this looks delicious, soggy or not! Yum, this looks great. I bet the toppings would be good on a base of pizza dough too. Sorry about the soggy crust, Annie. That's a bummer. But I think the topping is fabulous and would go on any number of crusts.